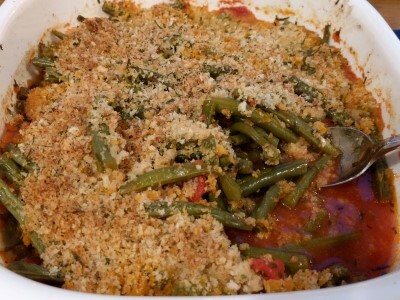 I still have a few posts from vacation in drafts, but I thought I'd take a break from Seattle restaurants and post this delicious casserole we made a couple of weeks ago: Green Bean & Tomato Casserole. I ripped it out of the Thanksgiving issue of Food Network Magazine. I'm always a little suspicious of recipes by the Food Network Kitchen (as opposed to the ones in the magazine from Giada, Bobby, Anne, Ina). We've tried a few and they were just OK/not that great. But we decided to give this one a whirl anyway and I am so glad we did because we both really, really liked this casserole. It helps that it's super easy. 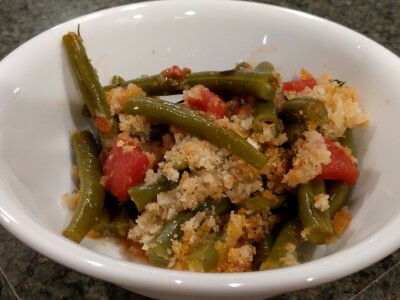 The green beans do not need to be blanched first. The tomatoes are canned tomatoes so there's no washing/chopping/juicing. There is a little grating (parmesan) and chopping (rosemary & parsley if you use fresh) but otherwise it's pretty much saute and simmer stuff in a skillet, occasionally stirring, then dump in a 3 quart baking dish, sprinkle on topping, and bake until heated through. It's delicious, reheats nicely, and gave us our vegetable side for 4 dinners. I've always liked green beans and tomatoes together. The bread crumbs and cheese topping adds a nice extra flavor but it does get a little soggy from the juices. It's still yummy, it just doesn't stay crunchy. Notes: we omitted the garlic & used shallot instead, SP added the red pepper flakes to his serving on his plate, and since we've never seen, and didn't see when we did the weekly shopping, canned cherry tomatoes, we used a can of diced tomatoes. This would be a nice side at Thanksgiving but I have a feeling we'll be making it a lot as our veggie side in the coming months because it's so easy and good for colder months.